Arthur A. Levine Books, 9780439831529, 48pp. The school on Elephant Island is holding a talent show, and all the children are excited -- all the children, that is, except for Ella. Belinda's going to do ballet, Tiki's planned a magic act, but Ella doesn't have a single idea. She can't sing, dance, or play an instrument -- doesn't Ella have any talent at all? 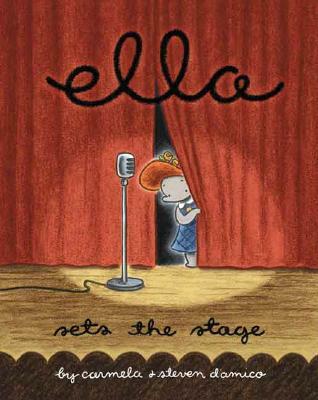 Then comes the night of the big show, and Ella discovers her own special talent that shines very bright -- even when she's not in the limelight. Carmela and Steve D'Amico put friendship center stage in this third charming elephant adventure. Carmela D'Amico grew up with the modest goal of trying her hand at everything once. As of today, she's completed about 32% of her mission. Meanwhile, she documents her interest in everything under the sun by writing kids books, young adult fiction, essays, poems and anything else that strikes her fancy. Steve D'Amico began drawing dinosaurs and superheroes at the age of five and was the cartoonist for his high school newspaper. Eventually he became Senior Art Director at Seattle-based Smashing Ideas where he designed and illustrated numerous games and websites for kids. Steve is the illustrator of several children's books, including the award-winning Ella The Elephant books, which became an animated TV series in 2014. He continues to illustrate and has two new books due out in 2015.